Made with high-quality materials and unique features not found on other seat covers, Solvit Premium Bench Car Seat Cover is built to last a lifetime. It’s a simple, elegant way to protect your vehicle’s seat and keep it clean. Cotton fabric, leather straps and brass accents come together to create a product that is equal parts luxury and durability. 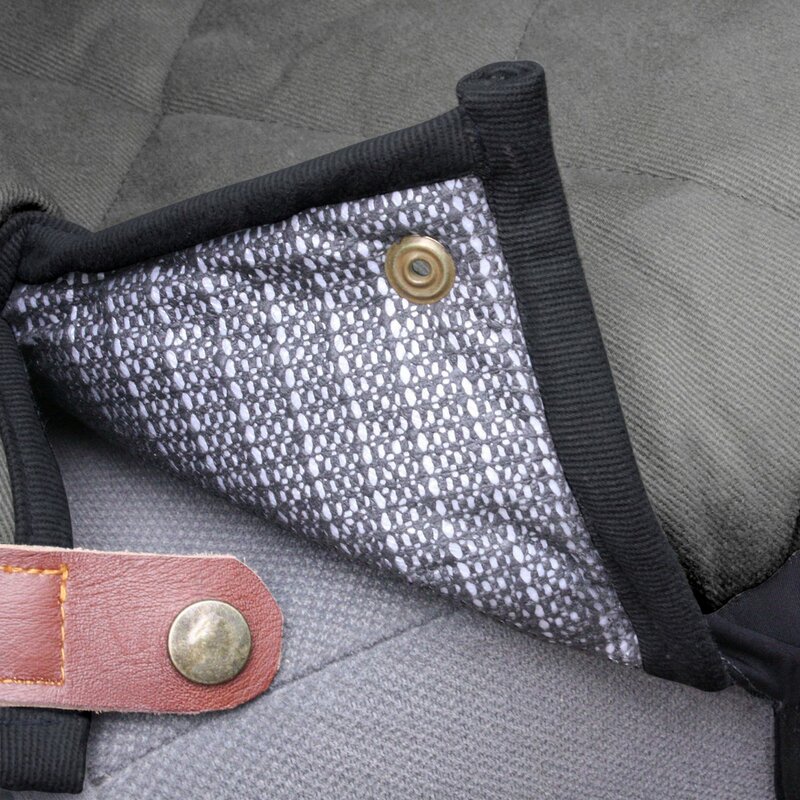 The seat cover is made from heavy, 100% cotton twill with quilting for an eye-catching design. Includes elasticized panels on sides and front, seat anchors, seat belt keepers, and cinch straps on corners for a perfect fit. A non-slip backing and proprietary SmartFit construction work together to hold the cover firmly in place. 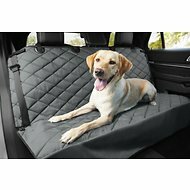 Solvit Premium Bench Car Seat Cover incorporates a completely waterproof membrane to prevent seat damage from water, mud and spills, as well as waterproof zippers to prevent dirt, hair and liquids from passing through the seat belt slits. Multiple attachment points are made with double-reinforced fabric at high-stress locations. And the sturdy brass fasteners can sustain even the roughest use. It’s even machine washable for easy cleaning. Includes elasticized panels on sides and front, seat anchors, seat belt keepers, and cinch straps on corners for a perfect fit. Provides a non-slip back holds the cover firmly to the seat and multiple attachment points are made at high-stress locations. Featuring a waterproof membrane to prevent seat damage from water, mud and spills, as well as waterproof zippers to prevent dirt, hair and liquids from passing through the seat belt slits. Cleaning: Promptly wipe up any foreign matter or standing liquid. Machine wash cover in a commercial size front-load washing machine. Use cold water with a mild detergent. Line dry. Always make sure the cover and vehicle seat are dry before installing the seat cover. The cover is held in place at the top by two adjustable straps which go around the rear headrests. Lay the cover in place on the seat, loop the straps over the headrests and adjust length for best fit. Locate two white plastic tubes sewn to the back of the cover. Push each tube into the gap between the seat back cushion and seat bottom cushion. The tubes can be removed with a strong tug, but hold firmly enough to keep the cover in place under normal use. Stretch the elastic panels found on the front corners of the cover over the seat. Find the two straps sewn to the front edge of the cover and pass each under one of the front corners of the seat and connect to the plastic adjustable anchors found on the sides of the cover (use of these is optional and might not work on some models if the seat is mounted to the vehicle floor). Side vents and seat-belt “keepers”: The cover includes two side vents with brass snap along each side and two fabric strips with hook-and-loop tape in each upper corner. These can be used to hold a seat belt if it is not being used. The effect of this is to better keep the outer edges of the seat cover in place. We could not be happier with the quality of this bench seat cover. We do have a full size Toyota truck and this cover is ever so slightly too short for the width of the seat (wish it was an inch or two wider), but we were able to stretch the sides enough that it stays in place. Great look. Solid cover. I have a really hard time finding seat covers that fit my truck. While the extra length was more expensive it was definitely worth it! The quality is great and it keeps my seat clean. I bring my dog to work with me at a horse ranch so she’s always is bringing in dirt, hair, hay, etc. it’s been so nice to not find sand under my cover! My coworker has already ordered one after seeing mine. It's definitely nicer than my weather tech seat protector I had but wish the part that stretches around the seat had a better stitch. I feel like that will be the first thing to break. 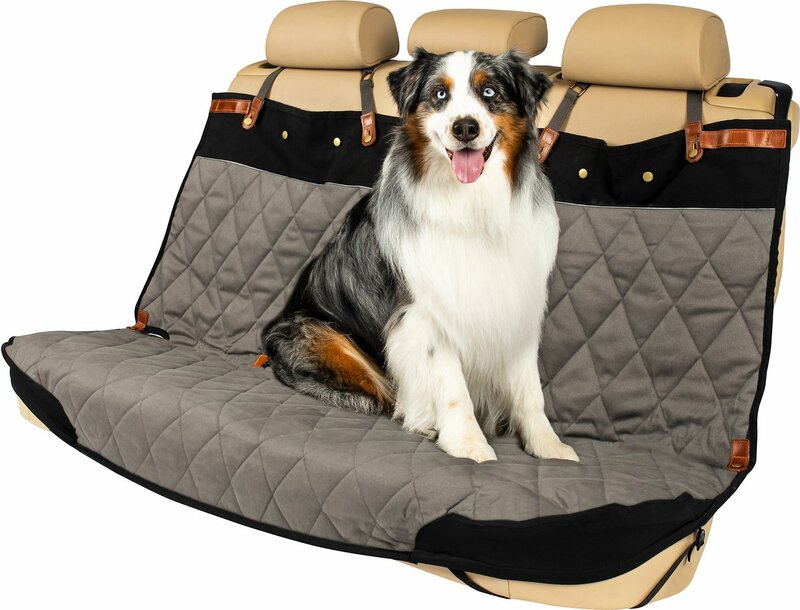 I ordered this after trying to go the cheaper route, should have known better, this fits in my Acadia great and it looks great too, my Chocolate lab loves it, no more sliding around on the leather seats when she goes with us, Very happy customer!!!!!!!!!!! 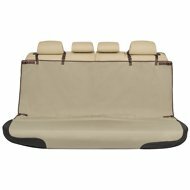 This bench car seat cover is heavy with quality built in all around. It doesn't shift when my medium size dog jumps on it...easy to clean/vacuum and stay in place. It fits my Nissan Rogue nicely. It's pricey but worth it...you get what you pay for! It fit my Subaru Outback very well. The design is very well conceived and quality materials are used throughout. We’ve had quite a few dog seat covers, but this one is in a class by itself. Chewy reviews were helpful in choosing this product. It exceeded expectations. Price was more than other products but you get what you pay for. This seat cover is thick, waterproof, adjustable, well made with heavy duty stitching, easily secured. It also looks and feels good. The regular size fit the backseat of my 2012 Toyota Camry perfect. For our SUV, I plan on ordering the larger size. The openings for seatbelts are well thought out. I also like the way the headrest straps can be moved laterally depending on your car. I highly recommend this product. Spend the extra money; you'll be glad you did. The cover is perfect. It fits well on our F350.. 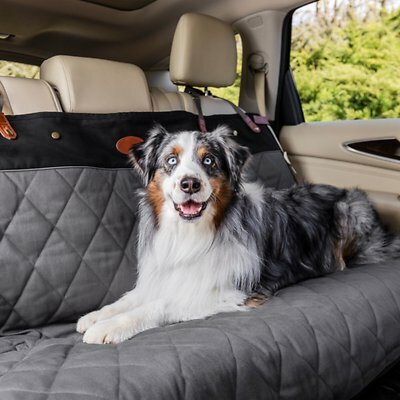 The material and craftsmanship of the cover make me feel it is strong enough to protect our Leather seats from scratches, dirt and muddy paws. I don’t think I would change a thing. I would purchase this item again.